Saudi father takes his boys to Islamic jihad in Syria — and expects them to die. In America, fathers take their boys on fishing trips or camping trips. 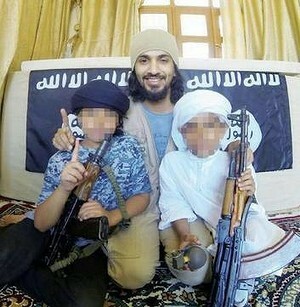 An Islamist Saudi father, however, has decided to take his boys to bloody jihad in Syria. A Saudi father gave his ex-wife the shock of her life when he informed her he was taking their 10 and 11 year-old-sons to join Islamist militants in Syria, telling her to count them as “birds in heaven”, Saudi-owned media reported. The pan-Arab al-Hayat newspaper said on Tuesday that the unsuspecting mother had been told that her sons, Abdullah and Ahmed, were going on holiday with their father, identified as Nasser al-Shayeq, in a neighbouring Gulf Arab country when she saw an Instagram photo of them in Turkey. Al-Hayat said she telephoned her son to ask about the photo, only to receive a message from her ex-husband, a former Saudi civil servant, to say that he was taking the boys to Syria to join Islamic State, one of the most militant groups fighting to topple President Bashar al-Assad. Gee, what a great dad!